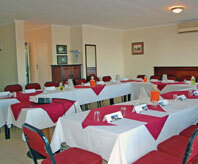 The Chapman Hotel, in conjunction with BLACKBEARDS® Seafood Tavern, offers conference and banqueting facilities. Besides being able to offer well-appointed accommodation and world-class cuisine for delegates, The Chapman offers guests personalized service, with an emphasis being placed on flexibility in order to satisfy the client’s requirements. Our focus is on being highly competitive and our comprehensive Conference Packages are based on the individual requirements of the client regarding the number of people attending the conference, seating, equipment requirements, catering requirements as well as accommodation requirements. - Complimentary notepads & pens. 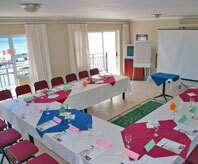 Designed for intimacy, our facilities are multifunctional. Whether you are hosting a small business meeting, product launch, cocktail party, wedding reception or important conference, we are committed to ensuring that your expectations are satisfied.